Driving in New Zealand is not for the faint at heart. Fair warning!! Before getting the keys to our rental car in Wellington, we had to watch a whopping 10-minute video designed to explain all we needed to know about driving in New Zealand — with particular emphasis on keeping to the left side of the road. As a reminder, there were handy “keep left” stickers on the dashboard. Needless to say, we took out as much collision insurance as possible. God help the people of New Zealand. As luck would have it, our car in Canada is a Japanese import with the steering wheel on righthand side. We both agreed that getting used to driving on the opposite side of the road while also sitting on the opposite side of the car would have been much more of a challenge. Safely out of the rental lot we quickly discovered that New Zealand is crazy for roundabouts (traffic circles). This driver-torture-device was covered briefly in our how-not-to-get-killed-on-the-road orientation video. but that didn’t really prepare us for the first one, nor the quick succession of roundabouts every kilometre or so. Instead of traffic lights on a four-lane road, urban planners plunk a roundabout at an intersection and everyone is supposed to go clockwise — keeping left, looking right for cars already in the circle and then, once you get in the vortex, have the presence of mind to understand which exit to veer off on. Frank drew the short straw and was the driver. As navigator, I was relegated to plot our course and keep us on it. This included anticipating the roundabouts, knowing which lane to be in based on the exit we wanted, properly signalling in anticipation of that exit, all while counting the exits whizzing by so that we’d know when to get the hell out. We encountered a dozen roundabouts just in the 30 minutes it took us to leave Wellington with our GPS set for Napier. There were dozens more in our future. The hills we climbed on foot the previous few days in Wellington were a precursor to the much longer climbs we soon drove to make our way up and over a range to one of the wine regions of New Zealand. The valleys were lush with an abundance of bushes, ferns and the occasional outcropping of trees. Everything was green and lush. We stopped for lunch in Greytown, about 75 km from Wellington. The highway turned conveniently into Main Street, lined with gift shops, restaurants and other stores and services that cater to visitors rolling through town on their way to somewhere else. From Greytown we drove another 250 km directly to Napier, where we had arranged to stay at an AirBnB for three nights. Like many portions of Canada, the drive between places can have long stretches of farmland with a town or city every 100 km or so. Alongside the highway we took, dairy cows and sheep farms were plentiful. It was a beautiful sight to see cows on steep, green hillsides shrouded in mist. It was impossible to stop and take photos in most places along the way because the shoulders of the highway were only about three inches wide. Unfortunately, the perpetual forecast for rain that we’d managed to avoid since arriving in New Zealand hit hard about five minutes before we got to the endless cluster of roundabouts that swirled us into Napier. Our GPS lead us up a steep hill to the address of our AirBnB. The house was hard to see from the street because it was at the end of a longer driveway set behind houses of this century. 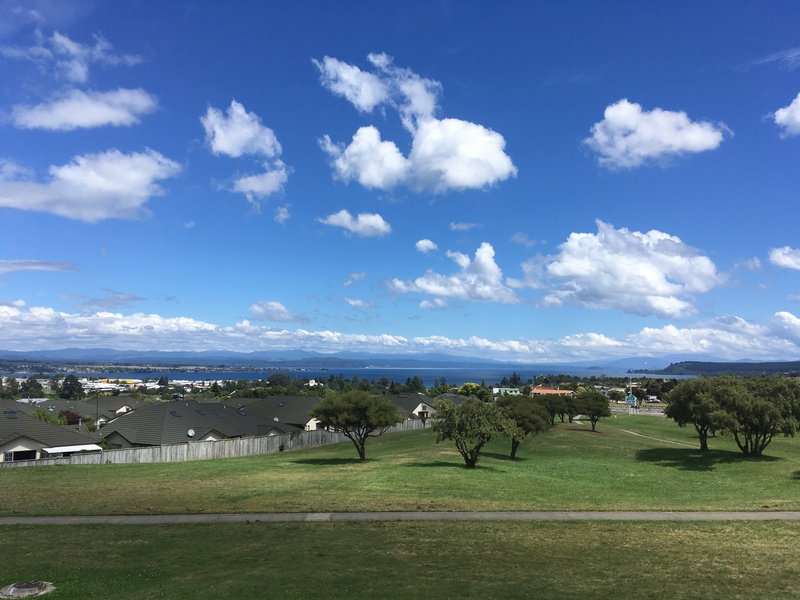 The very large historical home was once one of the few at the top of one of the highest hills around Napier, providing sweeping views in all directions. Over the decades of the past century, the large lot was subdivided and subsequently other houses were built around it. My first impression seeing the outside was that Frank had booked us into Grey Gardens. I fully expected that we’d be sharing a room (and bedside hot plate) with Big Edie. I’m happy to report that wasn’t the case. The current family has lived in the home for 15 years and they’ve done a loving job of restoring the interior. That said, the outside of the house, with its wooden siding takes a constant beating with the weather, which gave it that rough and tumble exterior and that isn’t a true reflection of the gem this house is. Our accommodation turned out to be the former gardener’s or chauffeur’s cottage behind the old house. It was perfect for us — one bedroom, a small bathroom (with a washing machine – helpful when you only bring carry-on for three weeks), a kitchen and living room. Napier is on the east side of the island along Hawke’s Bay. Besides being in a prolific wine region, it’s also known for its Art Deco architecture. In 1931, Napier was flattened by an earthquake and the downtown area was rebuilt in the style of the day. The city fully embraces their proliferation of Deco style. While we were there, the city was days away from their annual Art Deco festival – cars and clothing from the 20s and 30s were starting to emerge. It’s unfortunate that we couldn’t stay an extra day or two to see Napier really shine. As the drizzle let up, we’d venture out. We made it to the Mission Estate Winery for a quick poke around: stunning landscape. We also popped over to the neighbouring city of Hastings to see what they had going on: very little. Much of the main street seemed awash with empty storefronts. That didn’t seem to be the case, as much, in Napier. In our short, rainy time in Napier, we managed to make some new friends. By way of a very strange coincidence we connected with a friend of a friend of a friend we met a few times in Calgary 10 years ago. And as it turns out, our friend Kathleen, who lived in Napier for many years, knows this couple and through them (and her) we made other friends in Napier. With our friend quota exceeded and our fill of rainy days, we set off to Rotorua where we would be spending the next two nights. Along the way we stopped in Taupo where we met up with one of our newest friends, David. Bless him for bringing along blue skies and some sun for our outdoor lunch. 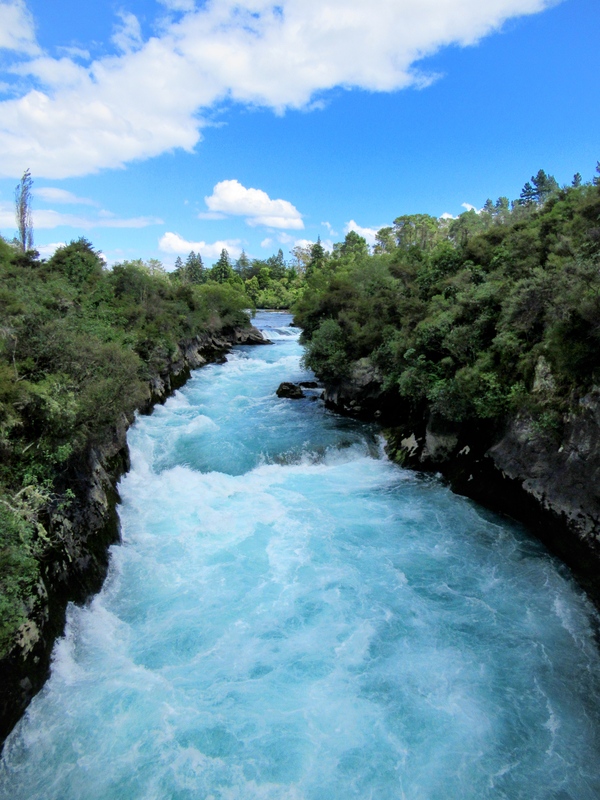 Taupo sits on a beautiful lake and had some picturesque natural water features. It’s was a great pit stop. Rotorua is a happening tourist hotspot for all things geothermal. Because the region sits atop some very active thermal reservoirs, people travel there to check out its other-worldly terrain, including boiling ponds and geysers. We took in some of that landscape and also visited a functioning Maori village. About 75 percent of New Zealand’s population has European ancestry and another 15 percent of the country identifies as Maori. We noticed the Maori culture is prevalent everywhere we traveled. Their symbols are the mainstay in souvenirs stores and their history and contribution to the country are featured in the exhibits and art of museums and galleries. It was an unexpected highlight to learn more about the indigenous people of New Zealand. The rain followed us for our two days in Rotorua and it continued as we jumped in the car setting off for our last stop in New Zealand (and final chance for sun). I’m quite frankly amazed with your lack of experience with roundabouts given all your travels! They are so much better at keeping traffic moving than lights…provided you know what you’re doing. I never though to warn you. I’m sure my description would have been easier than the government safety video. They’ve finally introduced that after many deaths as a result of tourists not keeping to the left! Glad you’re safely out of it…til next time. I grew up with roundabouts in Edmonton and after driving in England…well easy peasy! I look forward to the last instalment and I’m glad you enjoyed Napier!